After decades of stable price, thermal paper situation has changed since 2016. 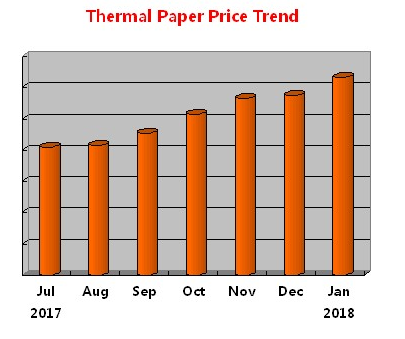 Thermal paper price has been increased month by month, sometimes even week by week. Why does this happen? To protect the environment, China lunched environmental inspection in 2016. They shut down polluting factories, mines and processing facilities. For paper industry, the government eliminated backward and excess capacity and shut down many small paper factories. This lead to capacity reduction of 40%. Capacity less, price higher. 2. Drop production of leuco dye chemical. The leuco dye chemical is produced by a Chinese company called Connect. It’s said it supplies 35%-40% of thermal dye for global market. Due to environment inspection, Connect are asked to suspend for rectification at least for 3 months. Without the key chemical, thermal paper manufacturer can’t produce any more. Lack of the chemical, paper producer couldn’t produce and supply enough paper even though the price is quite high. Koehler from Germany, Appvion from US and Oji from Japan are all affected by this issue. They all have to raise their prices. Mine and transportation cost increased. Imported paper pulp price was increased gradually. These are only part of the reasons related. What’s the situation in the world? Koehler has announced to increase price for all paper series. Same with Appvion, Oji, Hansol.